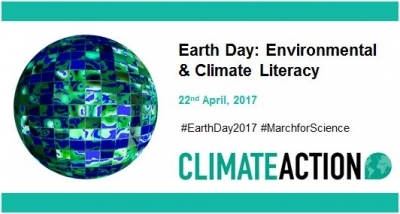 This year’s Earth Day (22 April 2017) has as its theme “Environmental & Climate Literacy.” In that spirit, I’d like to suggest that environmental and climate literacy require attention to the impact of industrial scale burning of forests, and the question of whether it makes sense as an investment in reducing carbon emissions. Yesterday there were articles in the press celebrating Britain’s first full day of energy without burning coal since 1882. You have to dig in some articles (not all) to find out that they’re still doing a lot of burning to produce energy, including of imported pelletized wood, which comes mainly from a combination of waste wood (which is limited in quantity) and cutting forests in the southeast United States. The rationale for cutting, processing, transporting, and burning massive amounts of wood to generate electricity is that it is “carbon neutral.” That is, the carbon released in burning the wood can be accounted as part of a cycle with growing trees (which captures carbon, as part of the natural plant growth process). But is burning wood on this scale really carbon neutral? And are other externalities, such as environmental impact at points of harvest, adequately taken into account? Should industrialized countries, which otherwise have been pretty good about managing forests – and have been preaching to developing nations about forest conservation and management – be exploiting its forest resources as “nature’s powerhouse” (in the terms of FAO‘s unfortunate slogan for International Day of Forests last month)? The push to burn wood to generate energy, in short, is policy-driven (the science of the matter being read in a way favorable to certain outcomes), and may actually be worse in total impact than cleaner fossil fuels. Big plants, big impact, small energy? And the conversion of facilities from coal-burning to wood-burning was expensive (again regarding Drax, see this critical opinion piece). Might it not have made more sense to convert to gas and/or invest in other non-burning renewables? “Transgenic” forests in the future? I have some small experience with wood energy, and my perspective on the larger issues comes in part from two sources. The first began with work on forestry projects in Mali and Guinea which had as part of their purpose, helping rural people grow trees for firewood to use in cooking, rather than cutting natural growth. I’ve maintained an interest and awareness of the problems involved in this source of energy, and various programs and proposals to ameliorate environmental, health, and other problems associated with it. The second is installing and using a fireplace insert in our home, which uses purchased local firewood (coming from cleared and fallen trees in the region), as well as smaller branches and in a couple of instances fallen trees near our residence. use of waste – that is wood that would otherwise go into a landfill, I am told. When you get these five together, that’s what I’d consider the “sweet spot” for wood energy, the optimal position for energy efficiency and environmentally sustainable wood use. Sometimes it is hard to stay in that spot, or next to impossible, such as in communities in West Africa I have known – so small scale plantations, and medium-distance transport of wood becomes necessary. Or in the US, the market drives producing wood for fireplaces and firepits (those small mesh-packaged batches of split wood for sale outside supermarkets). On the scale of, say, Drax and its suppliers, however, they’re off on all counts, pretty much by design: long distance between supply and use; very large scale; medium processing (not as bad as wood to liquid biofuel); indirect transfer (the heat released from burning only indirectly produces electricity, so there is energy loss); and due to the scale of demand, live trees are harvested and plantations made, with all kinds of externalities. Industrial scale burning of wood for energy in advanced economies, in other words, misses all the five criteria for optimal energy efficiency and environmental sustainability. So, if the “carbon neutrality” of this practice is also contested, why are we doing this? Wood energy is a reality for many today, but it is not a vision for long-term development. It is time to plan for the gradual split between energy – the technology for which is “ephemeralizing” away from burning and combustion – and forests – which have critically important climatic roles in addition to supplying wood and other forest products for our use. Of course, we will always like to sit by a wood fire on a cold night or at a campsite, or to grill over charcoal, but that kind of use should be as close to the “sweet spot” of optimization as possible. Ms. Seymour in her article cited above had a memorable summation of the arguments she made (it’s not a long read, and highly recommended): “Whether temperate or tropical, we can’t have our forests and burn them too.” Hopefully FAO and other major agencies and organizations concerned with the future of forests and/or energy will take that assessment to heart. 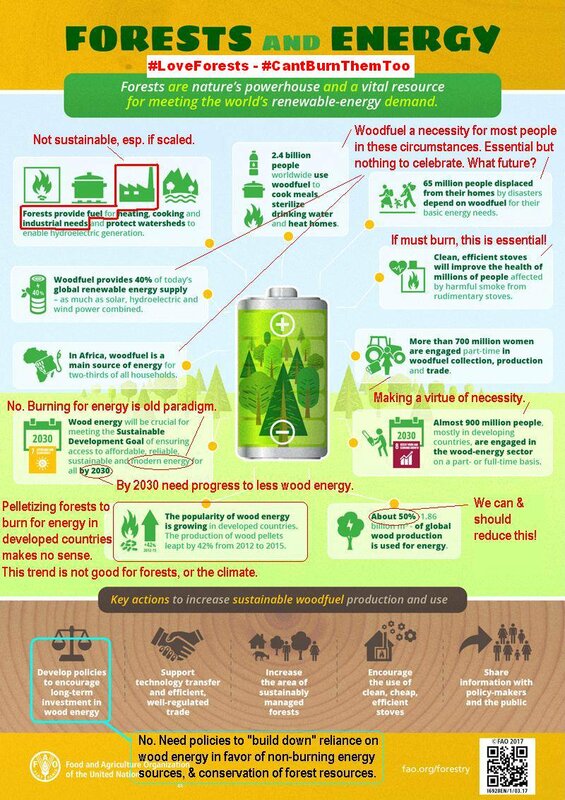 Comments on FAO infographic “Forests and Energy” from IDoF 2017.